It’s a bit difficult to grasp, this. The idea that nothing has happened until it’s happened. And before that moment, infinite outcomes are possible. 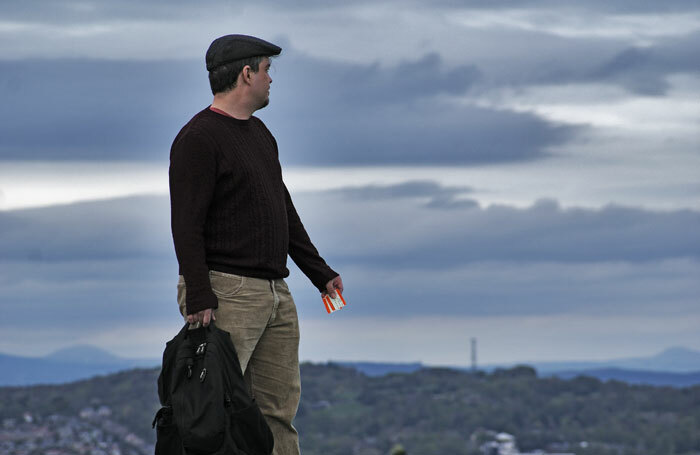 In Jim Harbourne’s searching debut play, prickling with moments of profundity, there’s a man about to throw himself off Beachy Head and a woman with an envelope that will either tell her she has Huntington’s Disease or that she doesn’t. Harbourne’s poetic script plays with the idea of multiverses and multiple possibilities, destinies and death. He and Kirsty Eila McIntyre narrate these two stories, with the solemnity and melancholy heightened by wonderful, mournful folk songs. There’s a guitar, a viola, autoharp, flute and a gorgeous harmonium. The two performers play them all, while singing clarion harmonies – it’s amazing what a sound these two people can make. On top of that are some simple but brilliantly executed illusions, employed perfectly for just a touch of magic. The over-ripe imagery of the script is a small gripe. What matters is that this folk gig-theatre piece holds in its embrace a colossal, nebulous idea and reduces it to a poignant, human message about the precariousness of just staying alive.